Dr. Bruna Brands, left, hosted CPDD International Committee Traveling Fellow Dr. Effat Merghati Khoei, Iran, for a research visit at the University of Toronto. 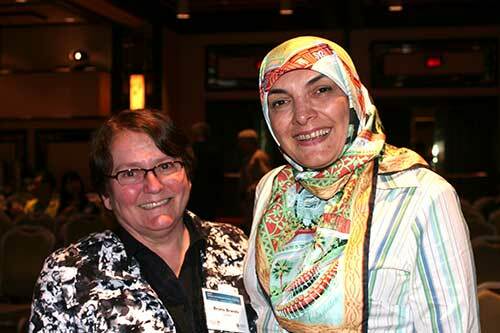 Former NIDA INVEST/CTN Fellow Effat Merghati Khoei, Ph.D., Iran, received the 2017 College on Problems of Drug Dependence (CPDD) International Committee Travel Award. NIDA, the University of Miami, and CPDD support the award for drug abuse-related public health researchers from low- or middle-income countries to participate in the NIDA International Forum, the CPDD Annual Scientific Meeting, and associated research training activities. As part of the award, NIDA and University of Miami funds support a research visit to a research institution. Dr. Merghati Khoei visited Bruna Brands, Ph.D., director of the University of Toronto Collaborative Program in Addiction Studies and senior science advisor to Health Canada. Dr. Merghati Khoei’s work focuses on gender issues in addiction. During her research visit, she learned about Canadian behavioral and medical addiction treatment programs and program development and evaluation. She hopes to develop cross-cultural comparative studies of treatment interventions. Dr. Merghati Khoei directs the sexual health clinic at the Iranian National Centre of Addiction in Tehran.